If there is one troop on the Builder Base that is both most beloved and most despised, it would have to be the Sneaky Archer. In the early days of the Builder Base, our common goal as players was to get through our loot-winning attacks as quickly as possible and move on. We had the Clock Tower (both pre and post nerf) that gave us several minutes of quick-time - a period during which our troops cooked and the Battle Machine regenerated in just a couple minutes top, which meant we could finish one attack and be ready to go for the next pretty much right away. Along came the “Trickler”. Tricklers would use up the entire time on the clock - 3 minutes plus preview time - as they trickled just a few Sneaky Archers into the base at a time. This ate up our precious boost time until the Clock Tower ran out and we were back to waiting 6-10 minutes between attacks. There was truly no more despised enemy than the Trickler. There were calls for nerfing the invisibility cloak of the Sneaky Archer. We formed mobs with pitchforks and torches, marching upon the ivory towers of SuperCell to demand satisfaction…. Ok…so maybe it wasn’t quite THAT dramatic, but it was definitely a bone of contention. Little did we know, that this was truly the precursor for what would become THE late-game, attack methodology. The Sneaky Archer uses an invisibility cloak to get right up close and personal with whatever she is firing upon, all with total impunity until the cloak wears out (or splash defenses find something else nearby). The strategic implications to this ability are huge and that’s what eventually brought SuperCell to slightly nerf the time on the invisibility cloak as the game progressed. The cloak goes from 3 seconds long at levels 1-5, to 5 seconds at levels 6-7, 7 seconds at levels 8-11, and 8 VERY long seconds at levels 12 and higher. There’s some math behind these attacks; masters of the Sneaky Archer have figured out just how many are needed to take down a structure before the invisibility cloak wears off. 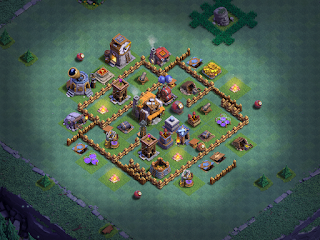 Resource collectors and other, low hitpoint buildings like the Gem Mine, Barracks, and Firecrackers, need just 2; more medium level defenses require 3; while high hit point structures need 4. Army Camps are good to go with just 1, and the Builder Hall itself usually goes down with 4. Of course, buildings that are out of range for defenses can be removed with just 1 but it takes a bit longer. Sneaky Archer based attacks require a great deal of patience and they usually take 2.5-3 minutes to run. It is not at all uncommon to still have troops in your bottom tray - unused - as you ran out of time. These attacks also require that you carefully dissect a base design during that preview minute, much like the custom attack strategies that I’ve discussed elsewhere. BH5 is where many players first started truly breaking opposing bases down and using a specific troop in a very specific way to achieve a win. The Mass Sneaky Archer attack was effective because it was consistent. Once you have it figured out and get that feel for the troop, you can expand the strat to include other troops more specific to the base layout you’re up against. ArchMin - Either 3x3 or 4x2, this strategy takes Sneaky Archers and Beta Minions. ABC - Sneaky Archers, Bombers and Cannon Carts typically formed in a 4x1x1 (or, occasionally, a 3x1x2). AMC - Sneaky Archers, Beta Minions, Cannon Carts…and the number of camps here are a personal choice, but often run 3x2x1 or 4x1x1. Sneaky Archer - Clears the periphery, picks up extra percentage points, sometimes opens walls, may take down the Builder Hall. Beta Minions - Clears peripheral structures and commonly used as a kill squad on the Builder Hall. Cannon Carts - Clears peripheral structures, especially those that are high hit points or further than a Sneaky Archer can reach, sometimes used as the kill squad. Bombers - Disrupts base-established pathing and opens the base for deeper penetration of structure clearing ground troops (Sneaky Archers, Cannon Carts, Battle Machine). The typical Sneaky Archer based attack will begin by clearing the outer ring of buildings. Most base designs incorporate an outer layer of “junk buildings” - structures like storages, resource collectors, and so forth - that will stall inbound troops or repaths them while the defenses sit inside a hub and fire upon the advancing troops. Removing these structures allows the attacker to focus on the juicy center of the base. The next step is to clear a path to the Builder Hall for the kill squad. This will vary depending upon what is being used for the kill squad, of course, but in every case you want to ensure there are no buildings to distract your kill squad troops and nothing between them and the Builder Hall that might take them out of commission (especially splash damage). Finally, you deploy the kill squad to take out the Builder Hall. It’s important to either trickle this troop in or spread it out so any remaining defenses - like splash defenses - or Mines/Traps don’t take out your kill squad in a single hit. This attack pattern will generally secure a solid 2-star result. Remaining troops are then used to pick up extra percentage points. Like custom attacks, there’s a great deal of planning that goes into a well executed Sneaky Archer attack. This is not a spammable attack strat - it just doesn’t work that way. However, it is VERY consistent and done properly will yield those magic percentages required to achieve the win the vast majority of the time. Here are two videos - a First Look and Second Look - to whet your appetite for this troop. CoC BB - Matchmaking (again)….